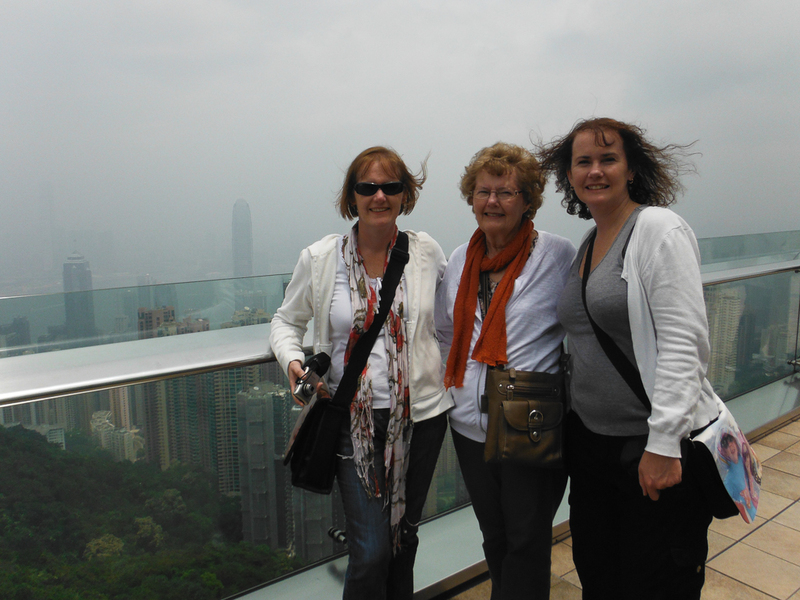 Last year I was lucky enough to get a leave pass from the family to go to Hong Kong with my mum & my sister. I have always wanted to go to Hong Kong & I am a little disappointed about not getting there before they closed the old airport (even though that was many years ago!). It’s been a long time since I have travelled without the kids so to be able to stay out late, eat at expensive restaurants, drink cocktails in sky high bars & shop in peace was just heaven. 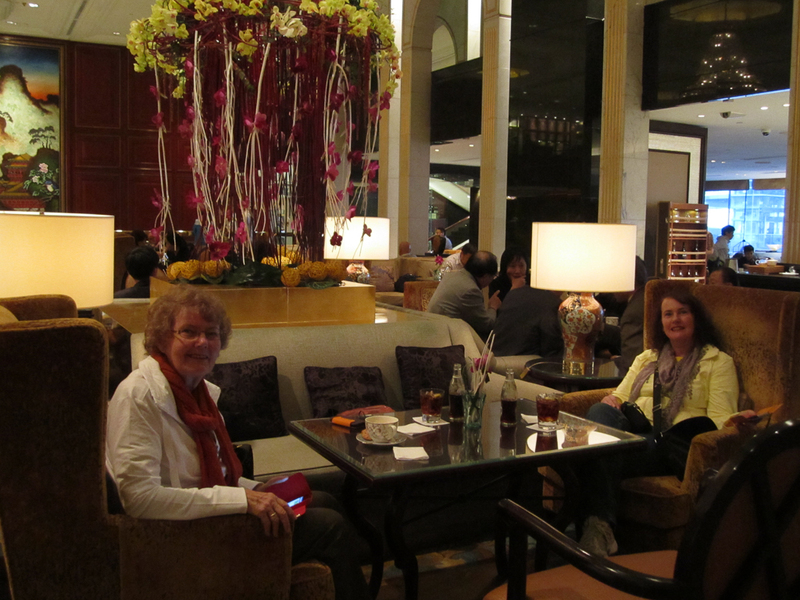 Not to mention the opportunity to stay at the Kowloon Shangri La, which was a highlight. I feel very lucky to have that experience & I’m very thankful to my wonderful husband that made it possible. 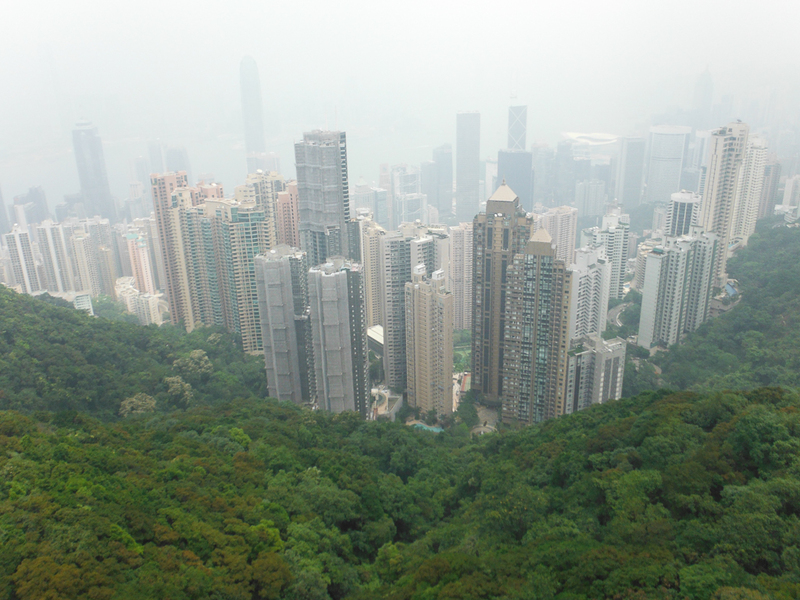 We were in Hong Kong in May which is late Spring, it was very foggy for the duration of the trip. 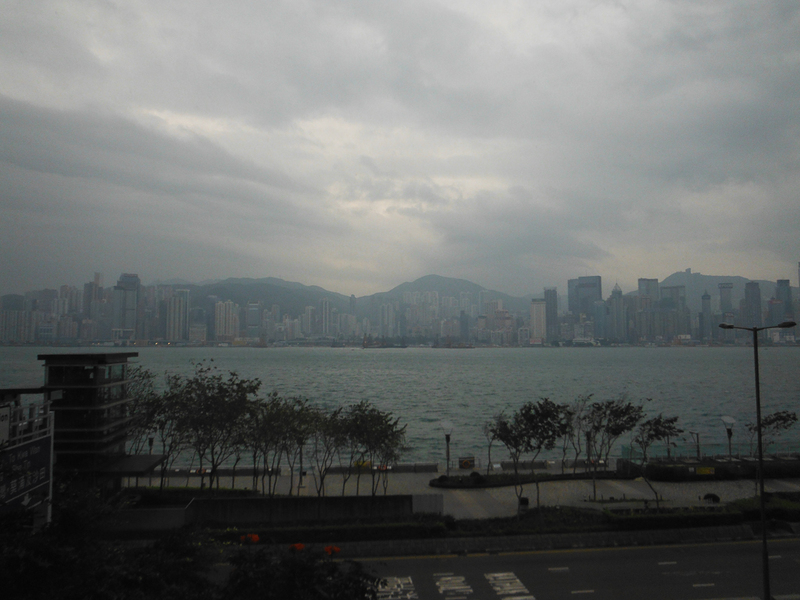 We were unable to clearly see the tops of the buildings when looking at the view from the Kowloon side. Whilst this was disappointing it didn’t really take anything away from the amazing view. The weather was warm, not overly muggy but the evenings I did require a light long sleeve top (oops, didn’t take anything suitable so had to go out & buy a couple!). Some friends of ours in Melbourne had previously been to Hong Kong & had enough Octopus cards for all of us. The Octopus cards enable you to travel on the Metro Train Railway (MTR), which is the easiest way to get around Hong Kong. 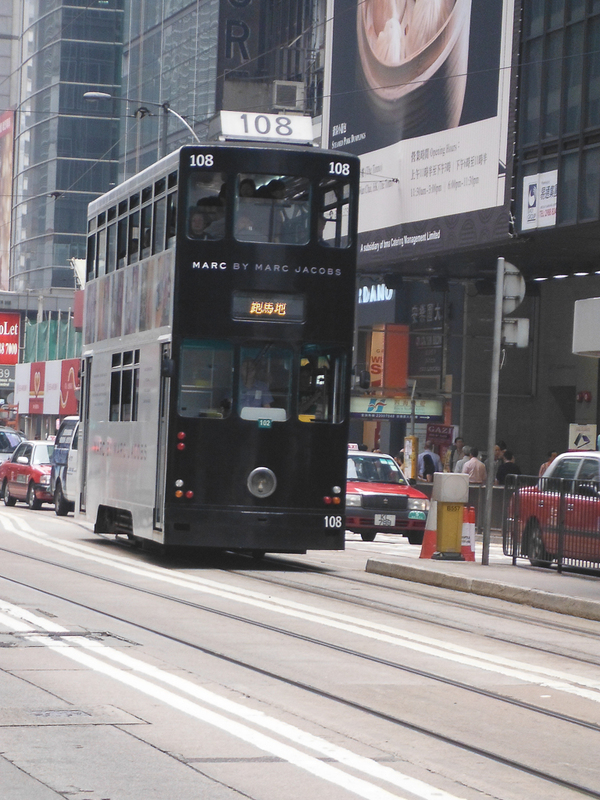 We purchased a train ticket from the airport to Kowloon & then caught the free bus service that drops the tourists to the hotels. 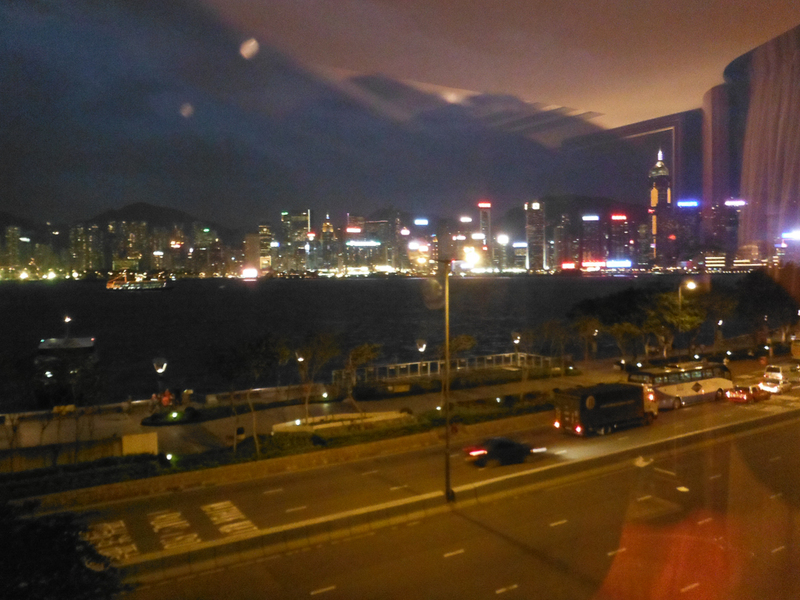 We arrived at the Shangri La & managed to get a free room upgrade to a harbour facing room. We went up to our room & the curtains were drawn. I opened the curtains to the most amazing view. 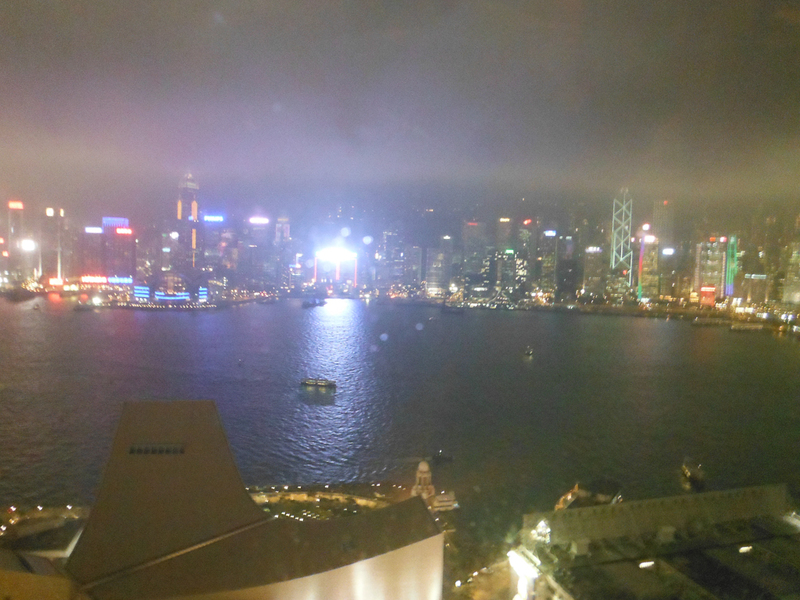 It was the first time I had seen Victoria Harbour in the flesh! No picture can explain how awesome that view is. I couldn’t get enough of it. If I was in the hotel room, I was in the window! First night we hit a local restaurant for dinner (where we were informed that dim sum is really only for breakfast & lunch) then afterwards we hit Temple Market. We bought a few bits & pieces & got a feel for what things cost & practised our bartering! 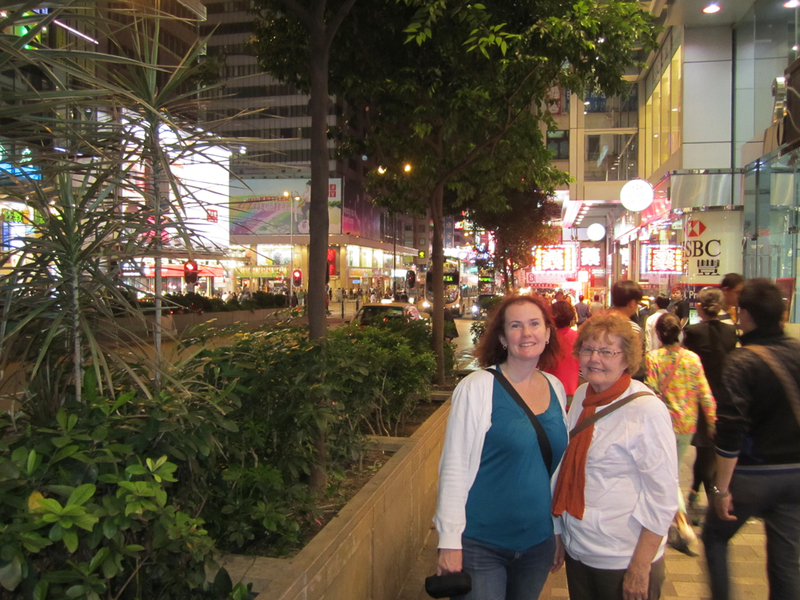 We walked back to the hotel down Nathan Rd. There was still plenty of people around even though we got back to the hotel at 11pm. I was surprised that most of the shops along Nathan Rd were still open. First morning we were up & out early. We walked along the Avenue to Stars, taking in the view that I don’t think I could ever get enough of. 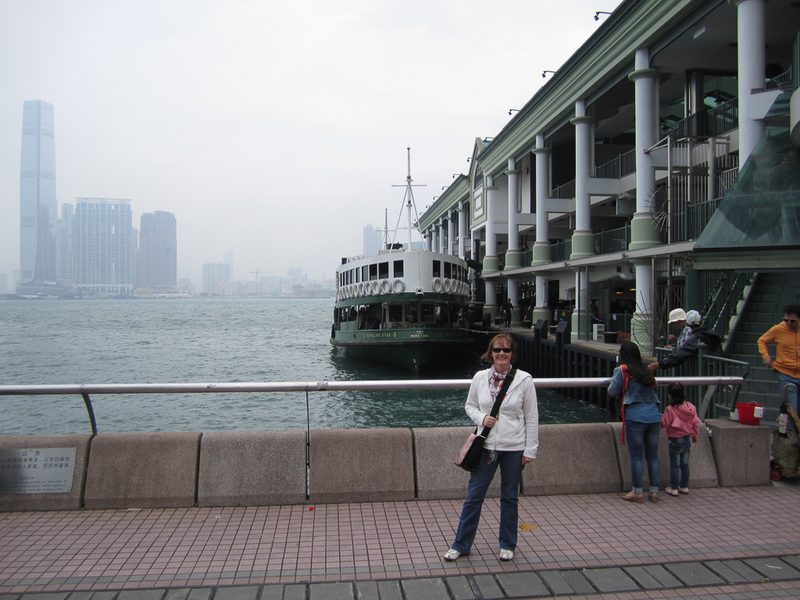 We passed the Peninsula Hotel & on to catch the Star Ferry. We decided if we had enough time we would return to do the High Tea at the Peninsula, as it turned out we ran short of time. Put that on the list for next time! View from our hotel window again! 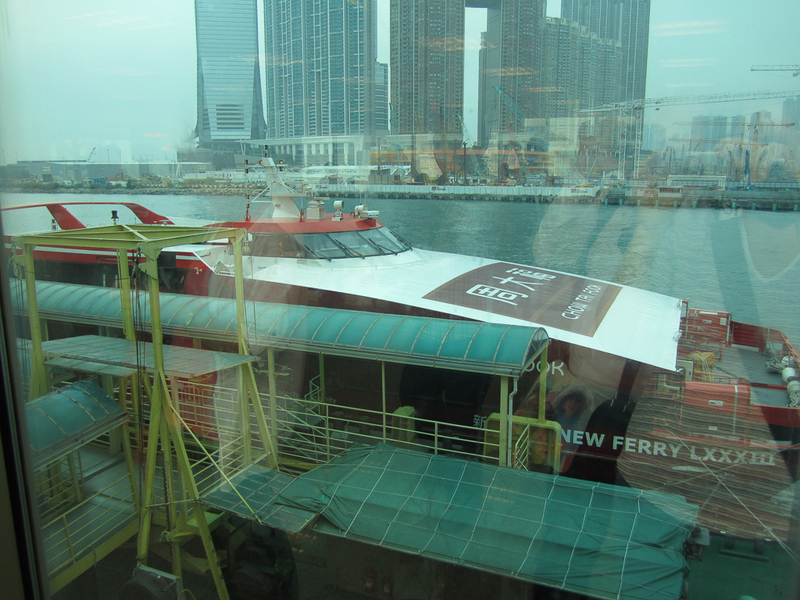 We caught the Star Ferry across to Hong Kong Island & jumped on the Big Red Bus tour which consisted of 2 routes. 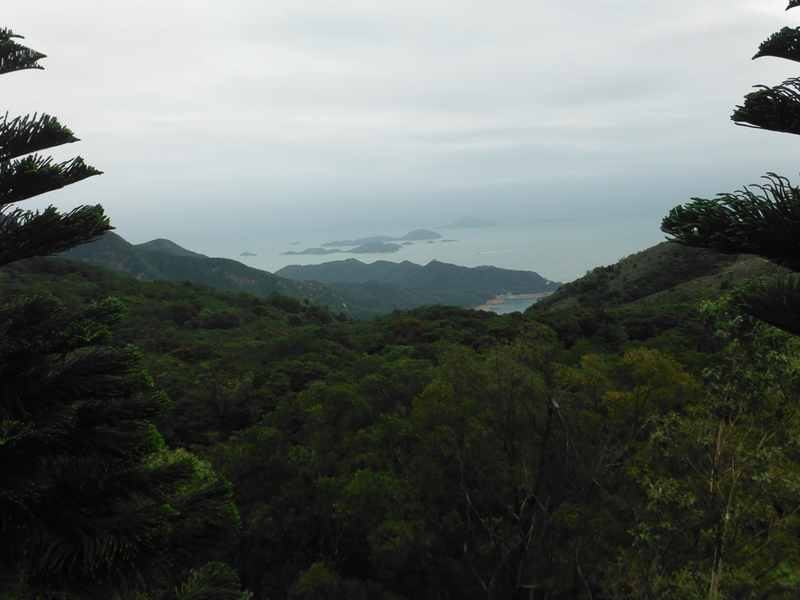 We started on the green route which took us to the Peak Lookout, Ocean Park, Repulse Bay, Stanley Market & Aberdeen. 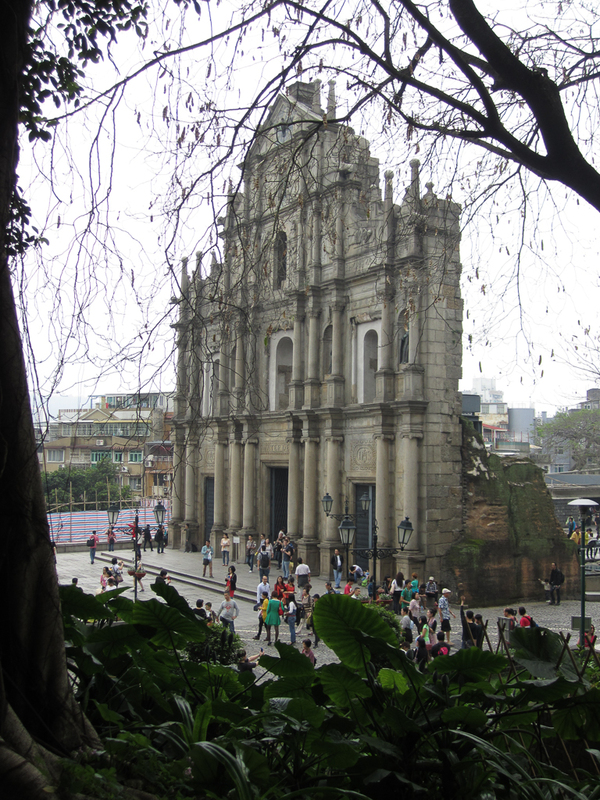 We also purchased the red route, the tours also includes the Peak Lookout, Man Mo Temple Lan Kwai Fong, Soho & Lascar Row. The Big Bus is a hop-on-hop-off bus & the buses are punctual & are at 30 minute intervals. It never felt like you were waiting long for a bus. The Big Bus allows you to quickly get your bearings on such a fast city. We purchased both the green & red routes in a 24 hour period. If I were to do it again I would allow a day for each, if I had the time. We did the green route first which was wonderful but we didn’t allow enough time to do the red route. We ended up staying on the red route bus without getting off so that we could see all the sites as we were running out of time. The Peak Tramway & Lookout was our first stop. It was fairly crowded & did take us a good half hour to get on the tram. 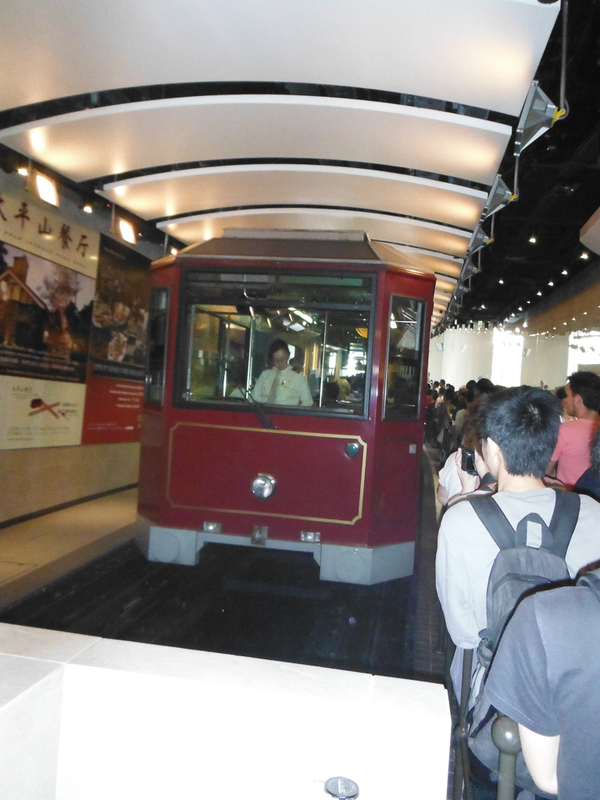 Its a short but steep ride up, at times I was wondering if the tram was going to roll back down the hill! The view from the top is like nothing I have ever seen before. 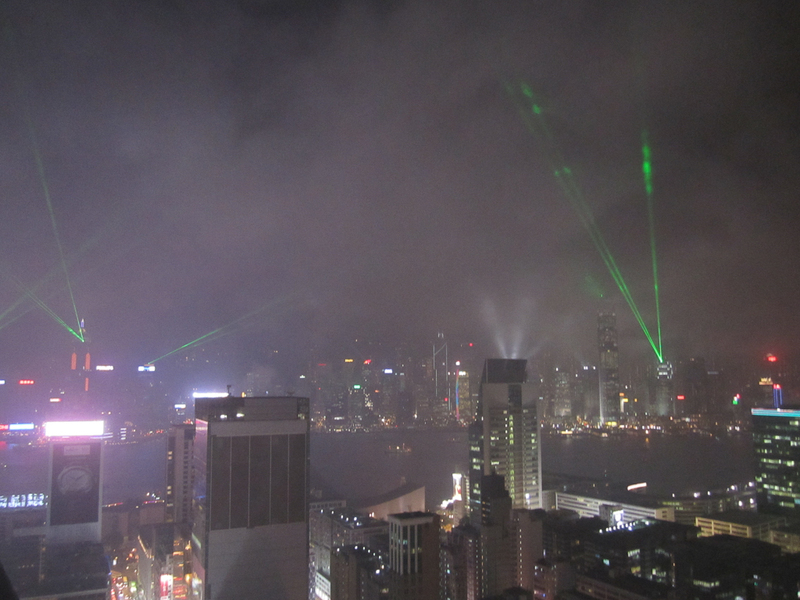 It was foggy & you couldn’t see across to the Kowloon side but it was still the most amazing city sky line I have ever seen. There’s plenty of souvenir shopping at the lookout & various restaurants. From there we got back on our Big Red Bus & headed out to Stanley Markets. 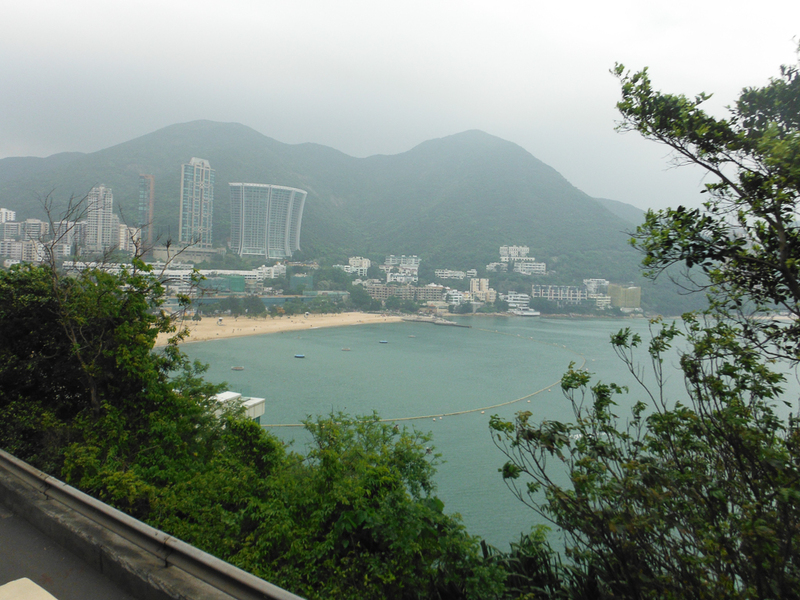 The drive out to the market takes you past Happy Valley, Ocean Park & Repulse Bay. Once you get out of town its surprising how pretty& green the island is on the other side. 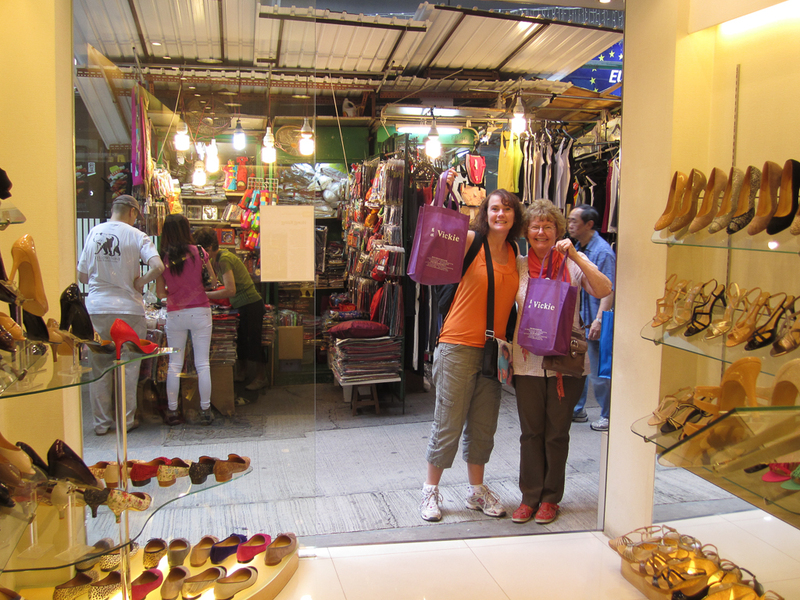 The market itself is small & there’s no bartering & there were plenty of tourists around. Most of the markets had similar products & I found the cheapest prices to be a temple market. 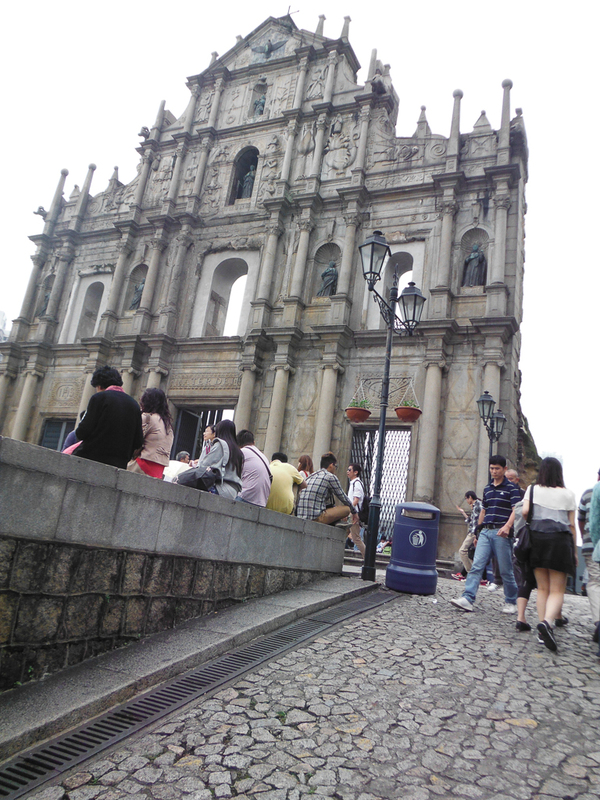 We rushed back from Stanley Market to get on the red route bus as we were running short of time & had paid for both. We stayed on the bus for the whole circuit which gave us a good overview of the island for when we returned later in our holiday. 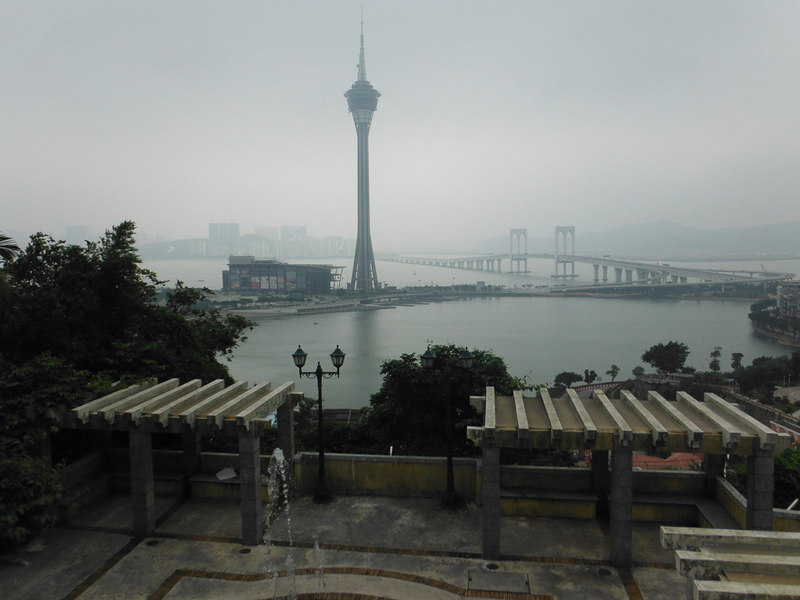 Day 3 included a day trip to Macau. The concierge at the Kowloon Shangri La organised for our ferry tickets, a private driver, dinner at a Portuguese restaurant & tickets to The House of Dancing Water held at the Grand Hyatt. 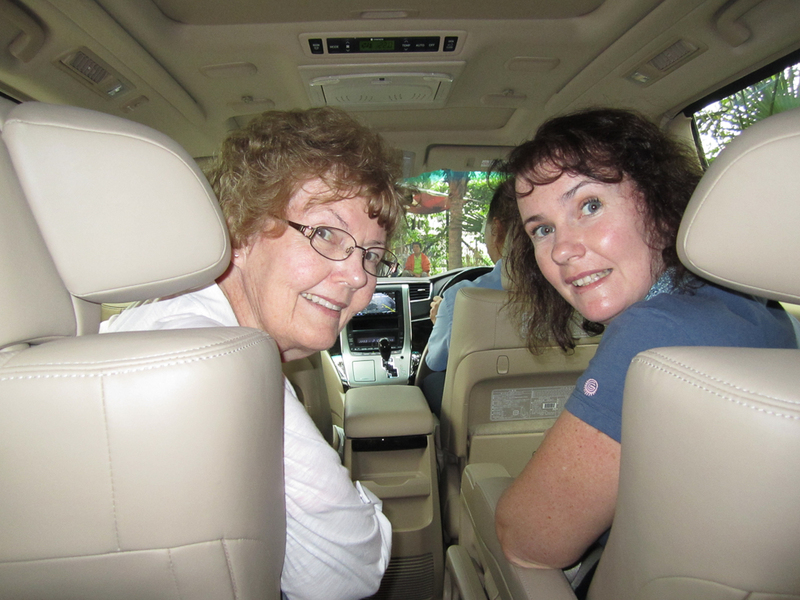 We booked Superclass on the way over & economy for the trip home. Superclass included food & refreshment. My advice, eat before you get on! Upon arrival we were greeted at the ferry terminal after exiting immigration & taken to our driver Mario. We paid Mario on arrival, 1500HKD ($200AUD) for a private vehicle for 6 hrs & Mario dropped us back in time for our return ferry (I have details for booking Mario if anyone is interested, I have booked him again for October 2014). 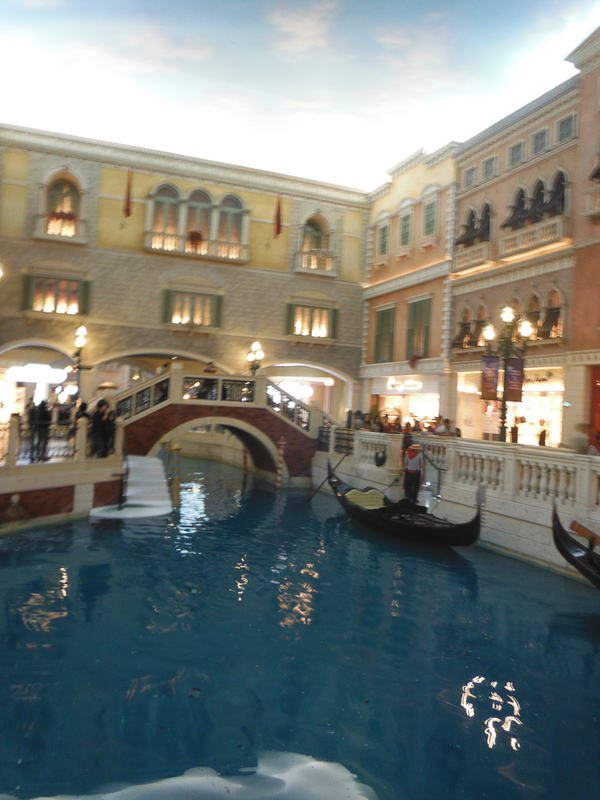 Mario took us to the main sites of Macau including St Paul cathedral ruins, the Fortress, A-Ma Temple, Macau Tower, The Venetian & various other casinos & to Lord Stows for a famous egg tart. 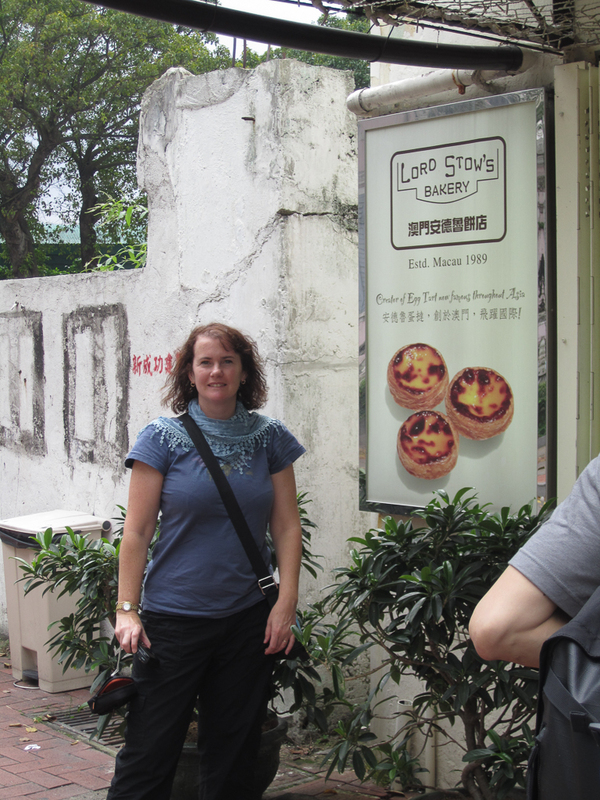 The egg tart was amazing, I could have eaten 10 of them! 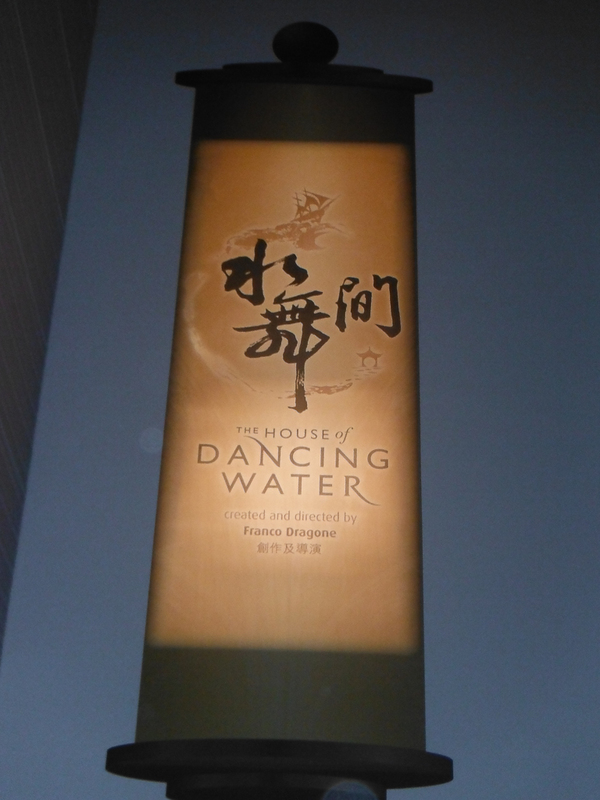 We were then dropped at the Grand Hyatt for the House of Dancing Water show. The tickets were a little pricey but it was well worth the money we spent. 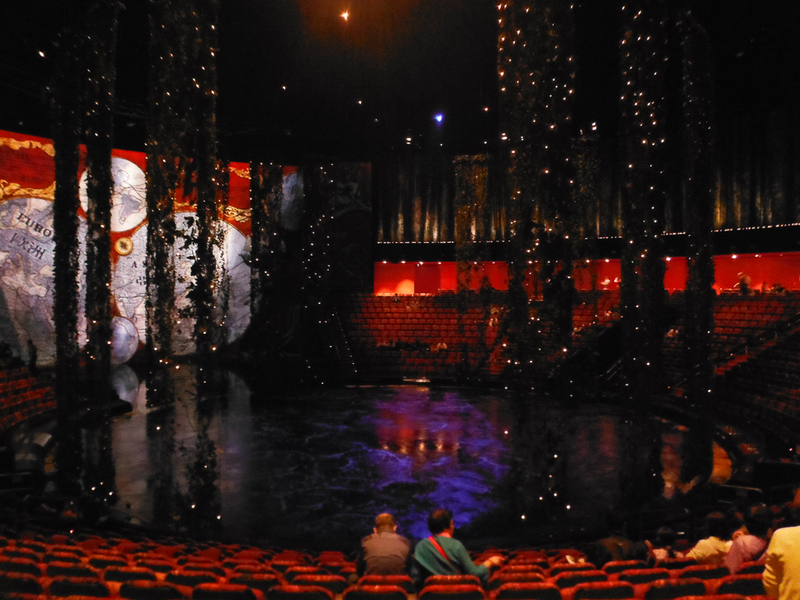 The show is similar to Cirque du Soleil but on water, don’t want to say to much here & spoil it for anyone planning on going. Mario then dropped us at Miramar Portuguese restaurant for a traditional Portuguese meal. After dinner we were dropped back at the Macau Ferry Terminal for our return ferry to Hong Kong. 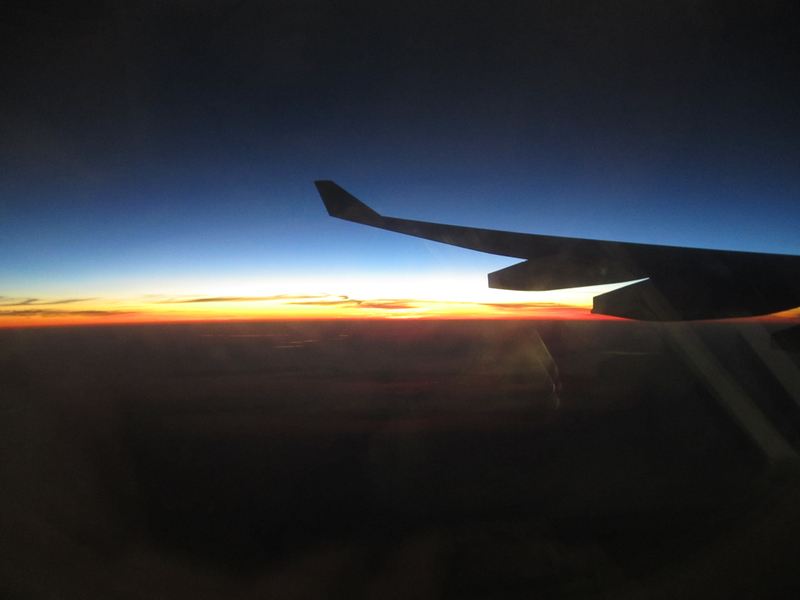 Economy class return was fine, it was very quite as it was 10pm & most people including ourselves had a little sleep. Day 4 we spent shopping. We were given a card for a fantastic jeweller in Hong Kong. After picking myself up a pair of diamond earrings (for Mothers Day) & a fairly flashy diamond ring (for our 10th wedding anniversary that was later in the year) my wallet was some what lighter! All three of us walked out with a ring & pair of diamond earrings of some description. The jeweller called & booked us a table at a dim sum restaurant, the food was delicious but the view from the window seat he booked us was just as amazing. 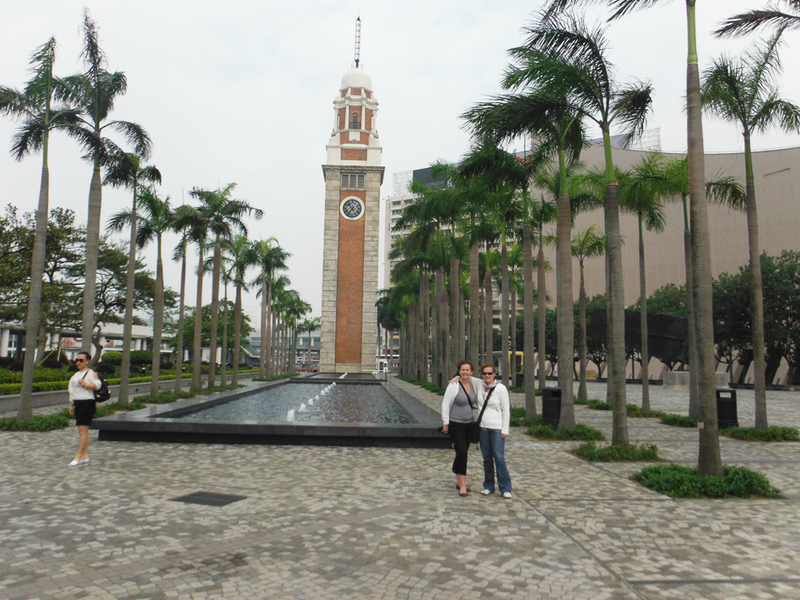 We spent the rest of day 4 shopping at the various shopping complexes on both Kowloon & Hong Kong Island. I managed to get a watch for my husband for our 10th wedding anniversary & got a computer hard drive that he had asked me to look for, from Wan Chai. The Computer Centre in Wan Chai is overwhelming! Its ridiculously cheap but best you know your prices, barter hard & don’t purchase from the first store. 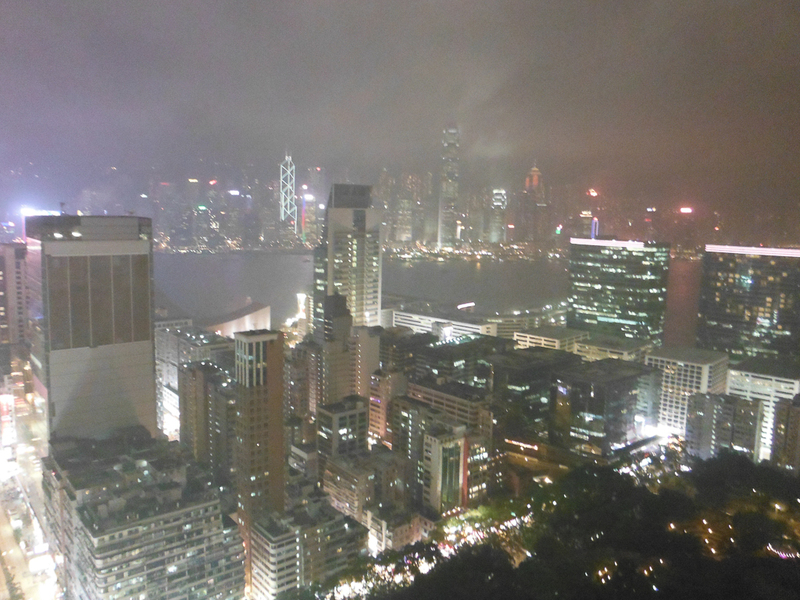 I’m going to get myself a GoPro from there in October when I return to Hong Kong. That evening we headed off to Wooloomooloo to drink cocktails & watch the Symphony of Lights show from the balcony. The light show wasn’t as spectacular as I had been expecting but this could have been a result of the weather, as stated earlier it was very foggy. You can see from the photos below. 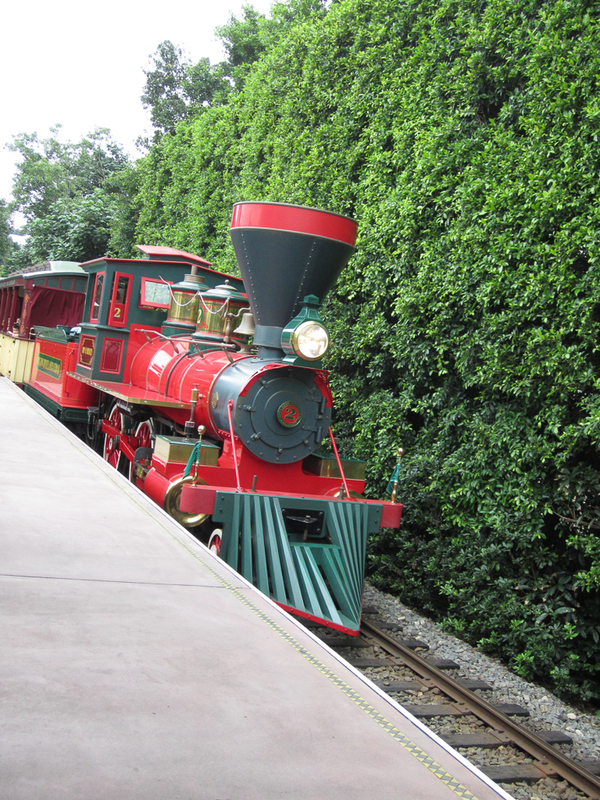 Day 5 Disneyland!!!! Fighting back my guilt about going to Disneyland without my kids, we arrived early for a full day of fun. My sister & I are, lets say, about late 30’s. 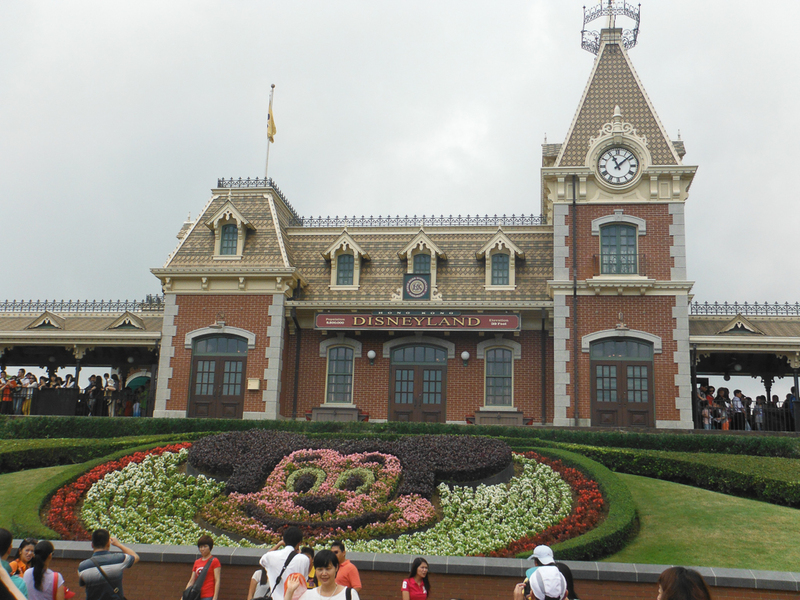 As we ended the gates of Disneyland mum says ‘this is wonderful, I always wanted to take you kids to Disneyland!’. I was a first timer & strangely enough I felt like a kid again. 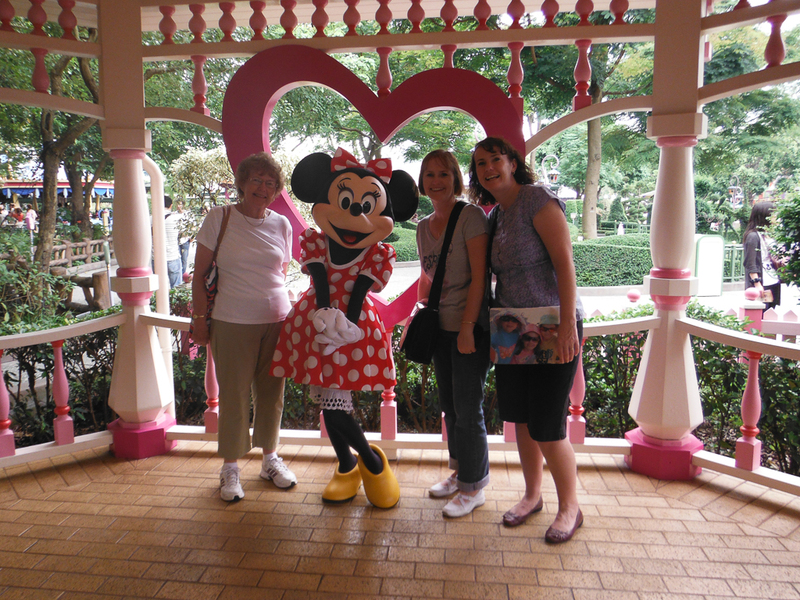 Mum & my sister have been to Disneyland California. 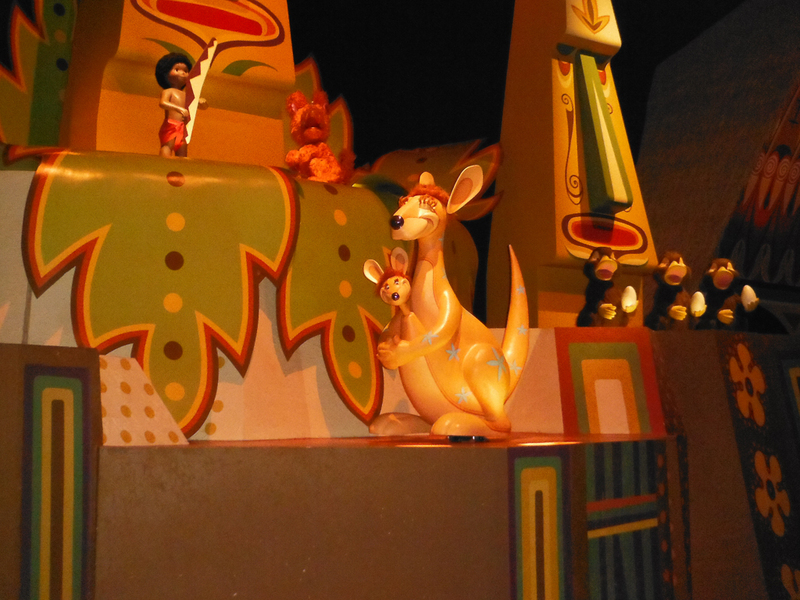 I went on all the tame rides (I’m not really a rides person) & mum insisted we went on It’s a Small World. You can’t go to Disneyland without going on the teacups! I waited an hour to have my photo taken with Minnie Mouse, the other characters had queues waiting the same time period so I settled on just one for the kids. I would have loved to get one with Mickey Mouse as well but suppose we can all do that this year when we are there as a family. 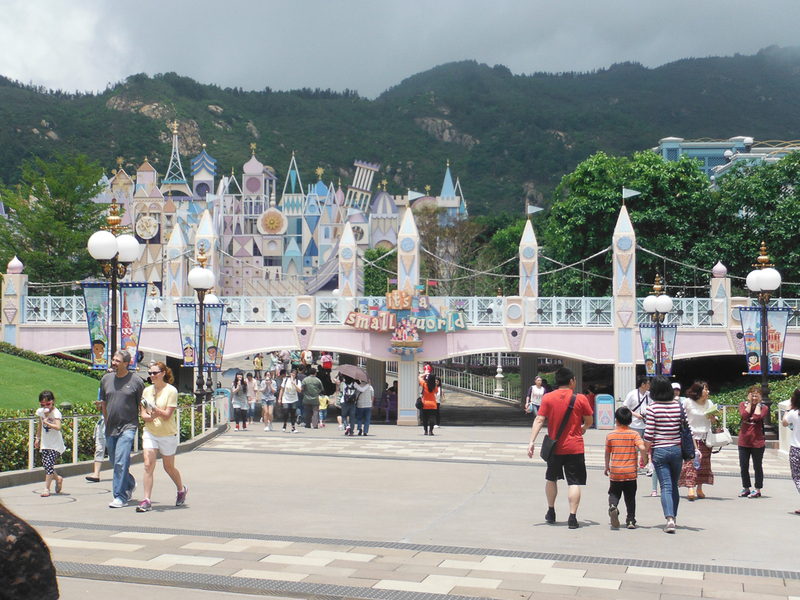 It was strange that the queues were so long as the park its self didn’t seem at all that busy. The only queues we waited in were for the photo. 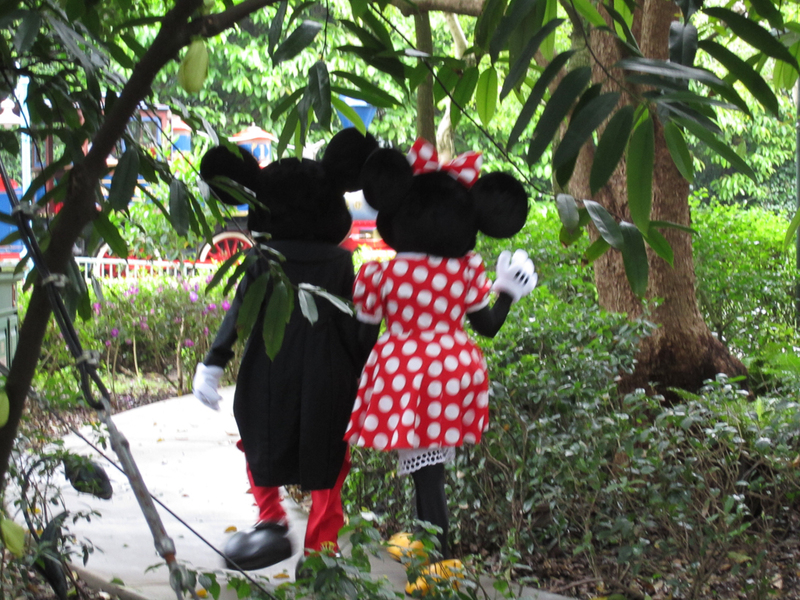 Mickey & Minnie Mouse, ahh love!! Late in the afternoon we had a massive storm hit Disneyland. The rain was so heavy, everyone ran to the nearest Disney Stores. This of course forced everyone to do there gift shopping at the same time. 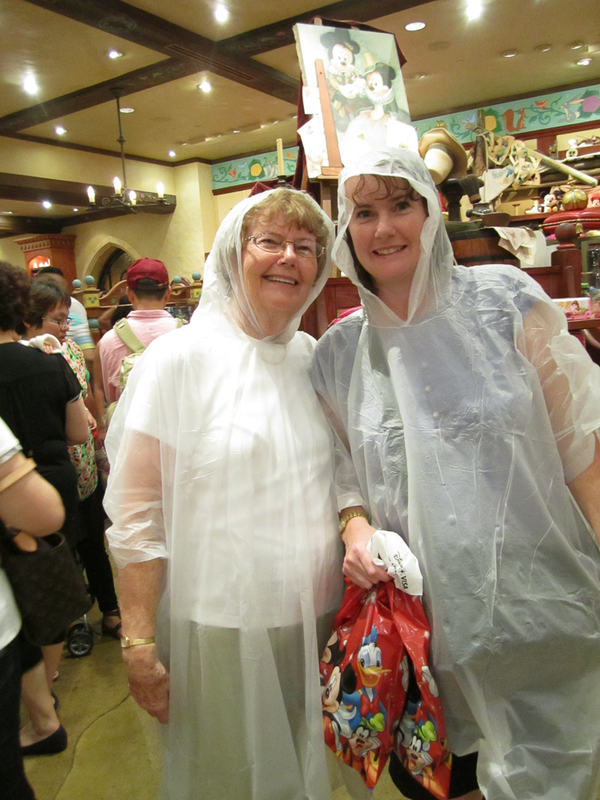 The rain didn’t stop so we purchased poncho’s & headed to the train station. Not a great move as nearly every other person was doing the same thing. There was a major crush with all the people trying to get out of the rain & into the train station. Many people were panicking as there kids were getting pushed & shoved. I was worried mum was going to get knocked over so I was holding her hand as hard as I could so no one would get between us. Once through the turnstiles things settled down as everyone dispersed along the platform. Day 6 was a real eye opener & a huge learning curve on bartering. With a couple of Aussie Expat we know from our employment, we caught the train, 1st class from Hong Hum to Lo Wu & entered China to go shopping at Shenzhen. You are able to get visa’s at Lo Wu & it took us no more than half an hour to organise. I had heard a lot of stories about people getting mugged in Shenzhen so I think I was a bit over cautious. Luckily I had no issues in regards to that. Luckily we had the expats with us, if we didn’t I think we would have struggled with the bartering. 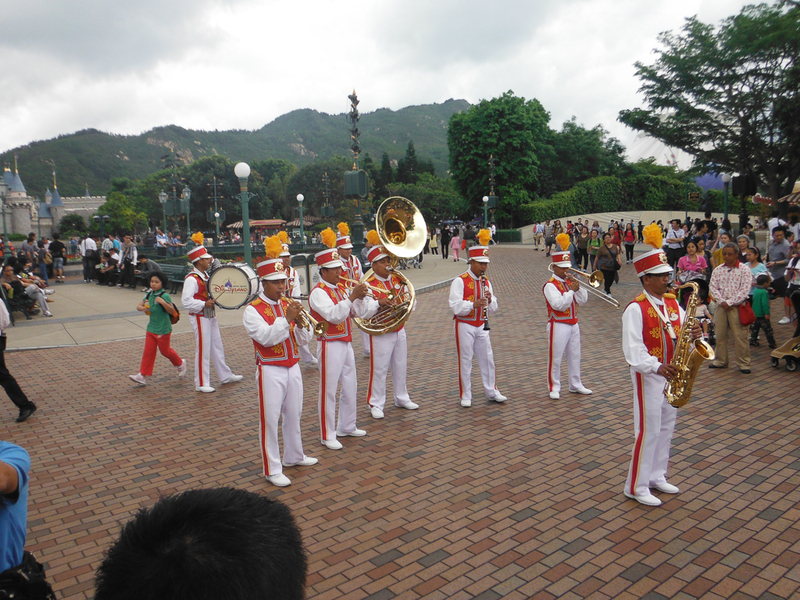 The expats had been there plenty of times before so if they gave a ridiculous price they would tell us to keep moving. There was knock offs in every possible product you could buy. I bought a couple of things but didn’t go made. I had a cashmere winter jacket tailor made, that was posted to me back in Melbourne about 5 weeks later with 3 suits my sister had tailor made. Both Chinese Yuan Renminbi & Hong Kong Dollars are widely accepted in Shenzhen. The expats left early & we stayed back & did a little bit more shopping, we got ripped off on a couple of things but hey that’s the game! I’m happy with what I paid & they saw me coming!!! We left after dark & I think if I was going to go again I would leave before dark. Nothing happened I just felt a bit uneasy as the train station seemed to have a lot of people just hanging around & begging. That evening the 3 of us went for foot massages at Top Comfort Massage recommended to us by the concierge at the Kowloon Shangri La. After all the walking we had done it was fantastic, I thought I was in heaven with just the right amount of ouch as well! 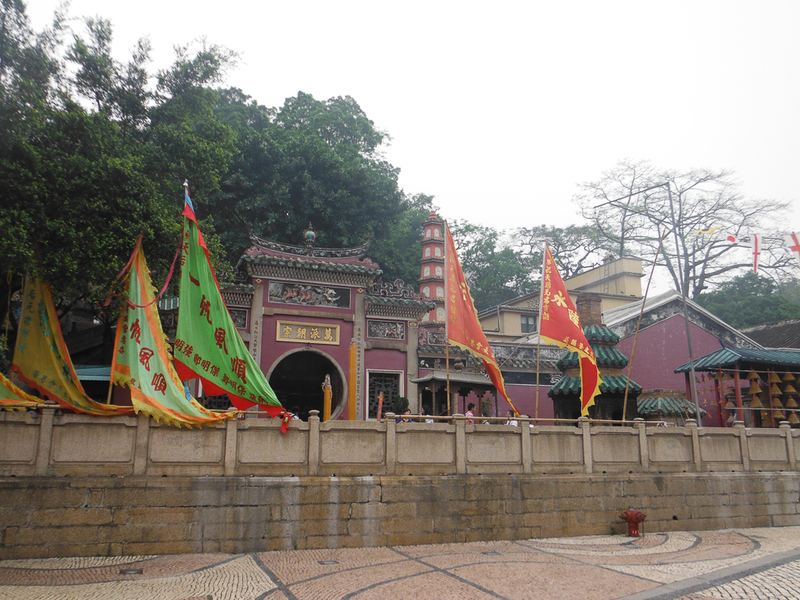 Day 7 we headed off to the Big Buddha on Lantau Island. 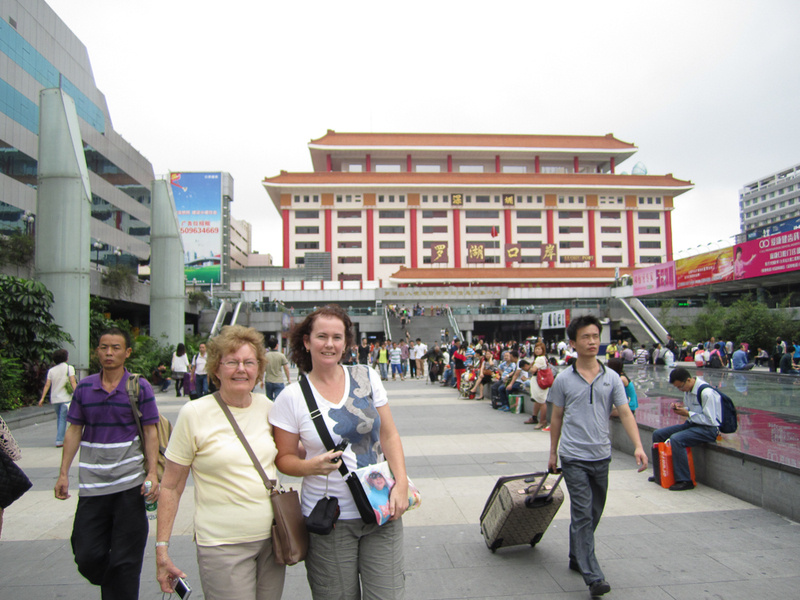 We walked up all the stairs to the Big Buddha & had a look at the all the souvenir shops at the top. The view from the top was well worth the pain of getting up all the stairs. Who I am to moan when my 70 year old mother made it up no worries. Mum was amazing she kept up, no problem, with the cracking pace we set for her throughout the whole trip. 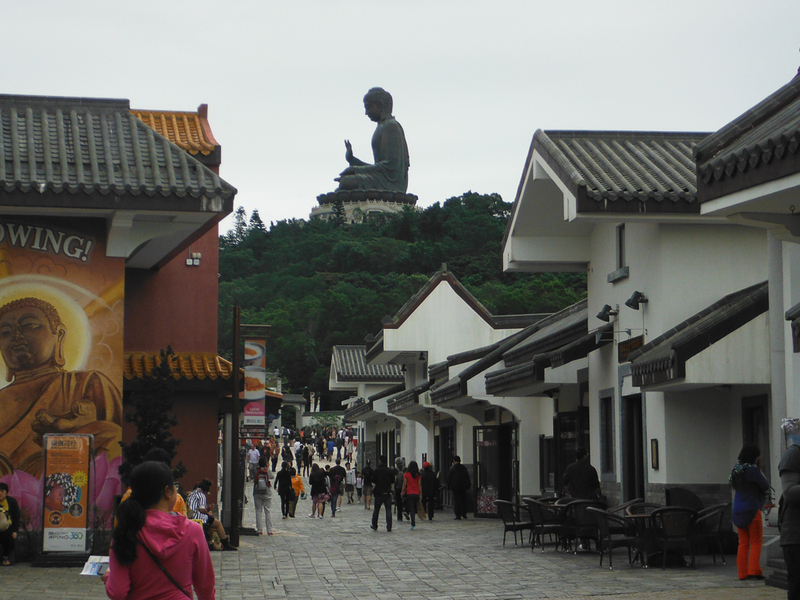 There are a few restaurants at the Big Buddha & we had dim sum at Ngong Ping Garden Restaurant. 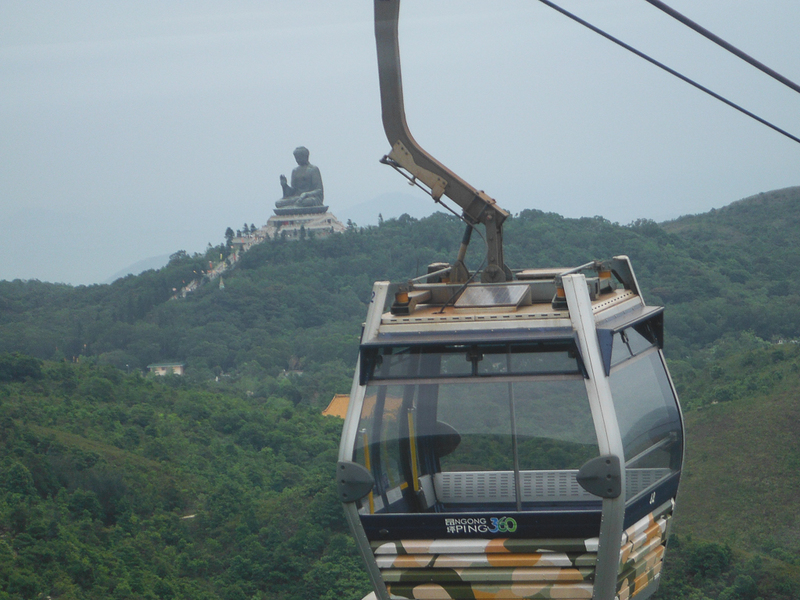 The quickest way to the Big Buddha is on a cable car & its well worth is as the views are amazing, so green & lush. 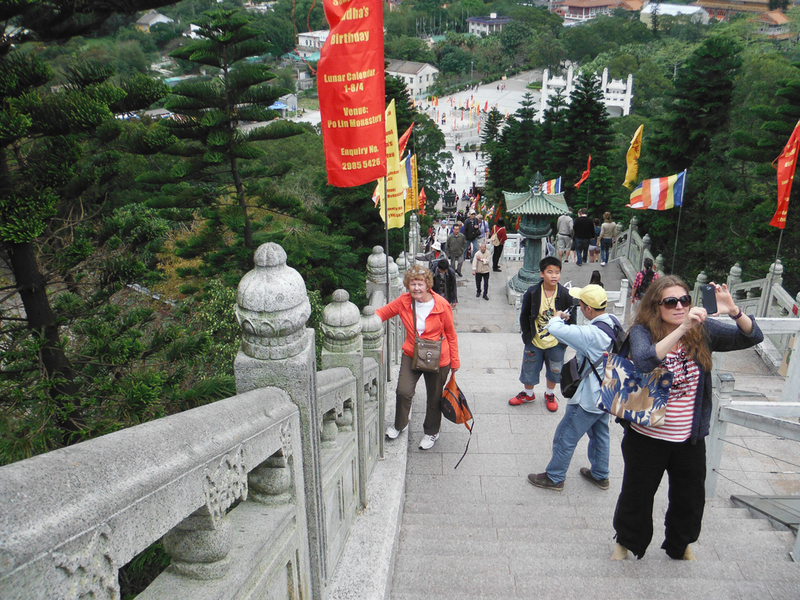 There’s a walking track that you can take but it would take a good few hours if not more to get to the Big Buddha. 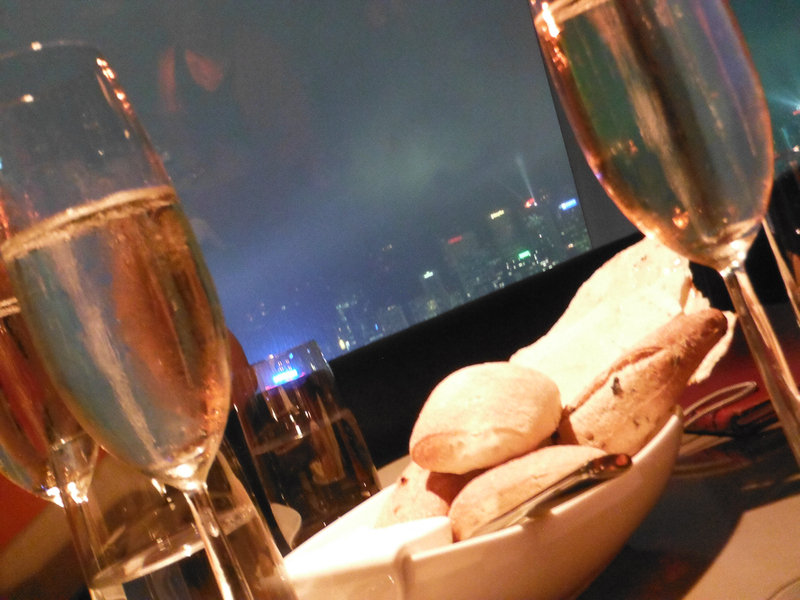 That evening, which was our final night in Hong Kong, I had booked a table at the world renown restaurant Aqua. 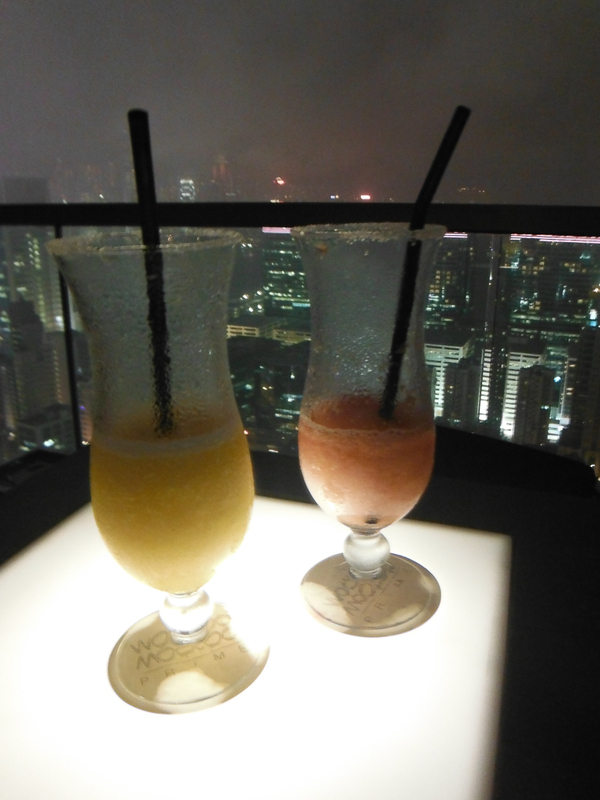 Aqua is located on the Kowloon side, its located on the 30th floor at 1 Peking Rd, Tsim Sha Tsui. 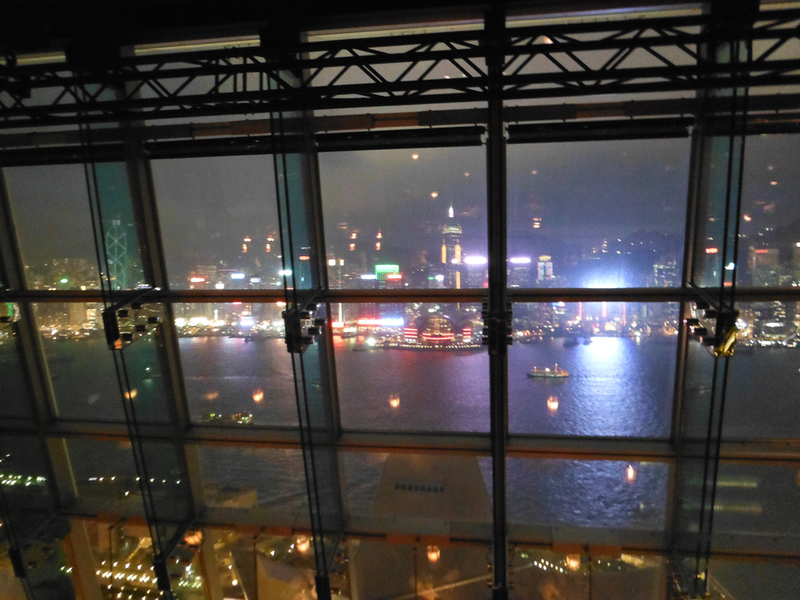 It has floor to ceiling windows with the most amazing view of the harbour. When booking request a table in the window & book for 7.30pm so that you are front & centre for the Symphony of Lights show. I booked at least a month earlier via the internet to ensure we got a window table. The restaurant is rather pricey but it was well worth the money that we spent. Day 8, our last day in Hong Kong. 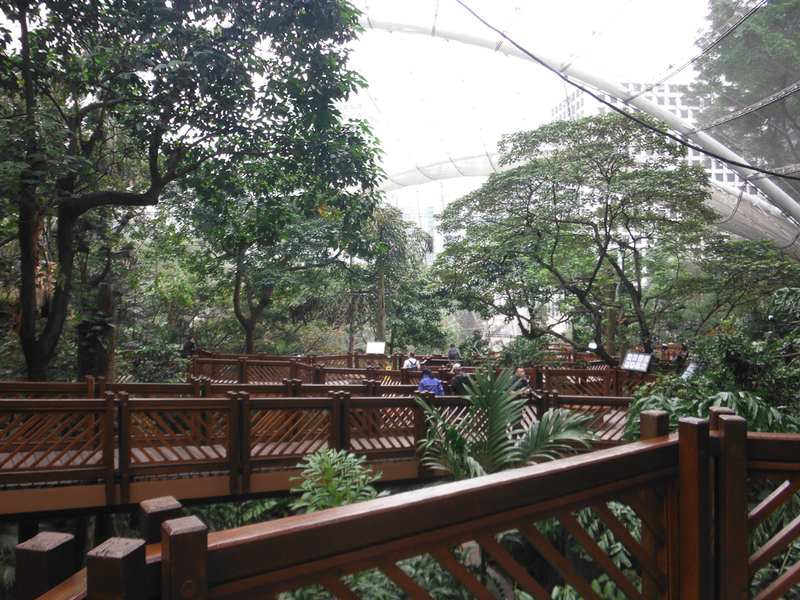 I like birds so was looking forward to visiting the Hong Kong Gardens to walk through the open air aviary. The aviary was amazing, there was a large variety of birds, the most amazing thing was listening to the birds but looking up to be surrounded by skyscrapers. It was a great experience. 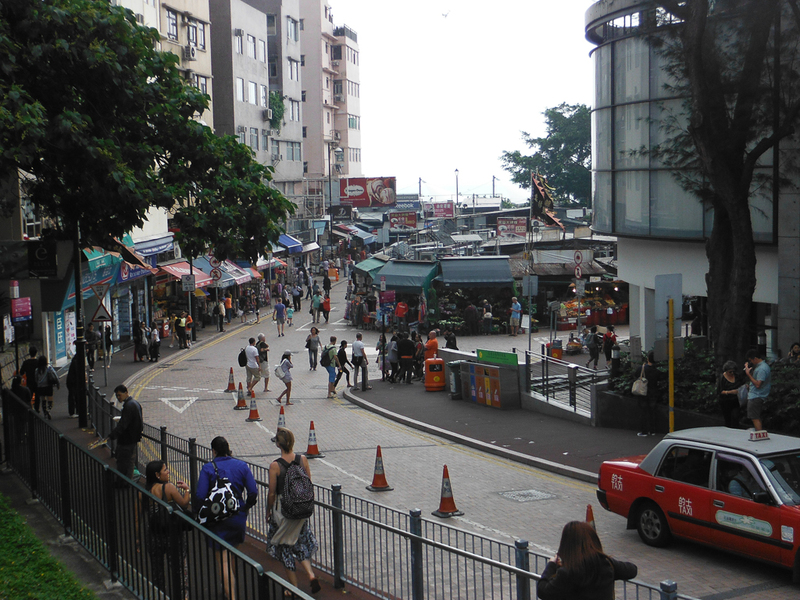 We then returned to Stanley Market to pick up a few things that we had seen earlier but thought we would see elsewhere but didn’t. The bus trip out there was worth the second trip so it was nice to take it in again. 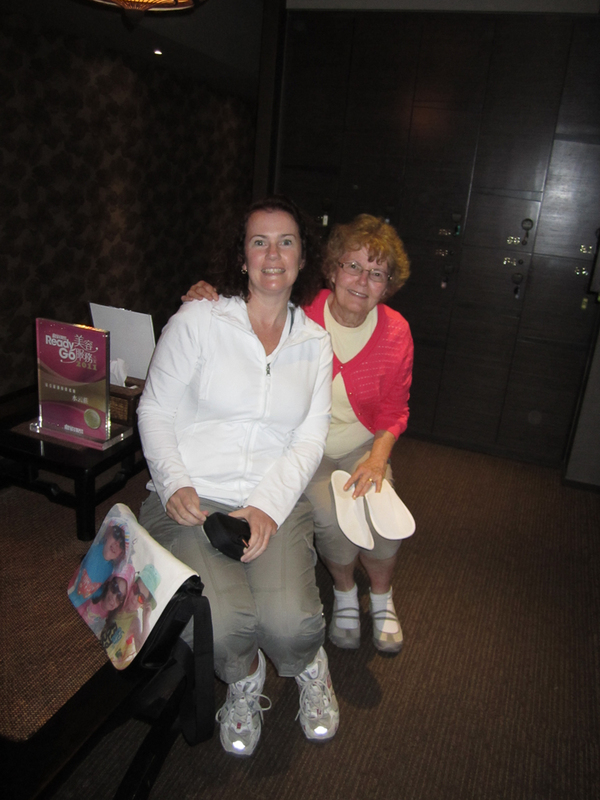 We returned to the Kowloon Shangri La & freshened up for our 8.30pm flight, we were able to use the Health Club for showers & changing as we had checked out that morning. 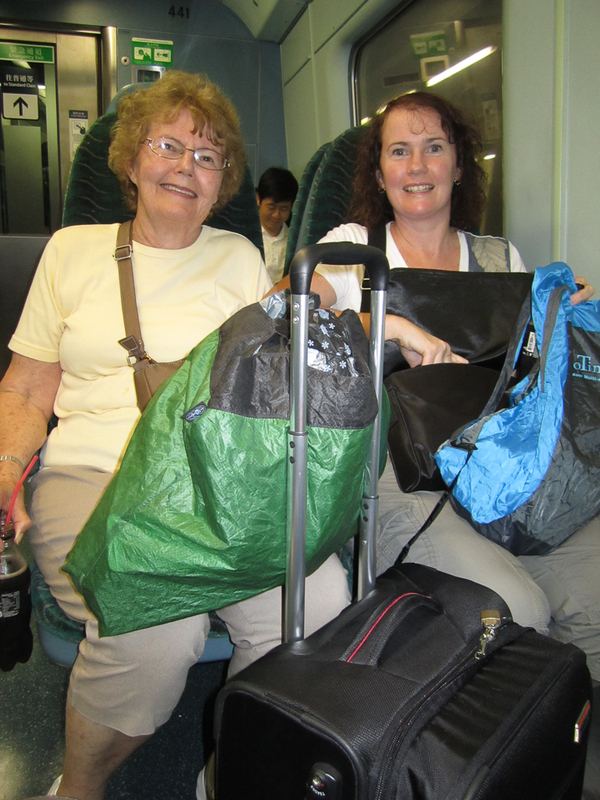 Due to the amount of shopping us ladies had done, we had a couple of extra suitcases compared to when we arrived. Ringo the head concierge at the hotel organised for us to get a limousine back to the airport. Ringo was amazing, he was the icing on the cake of our fantastic trip. There was nothing he couldn’t organise for us. When we arrived at the airport, he had also organised for a porter to meet us & help us with our luggage to check in. As I stated at the beginning there is nothing budget about this holiday & I was very lucky to be able to have had this experience as it would not have been possible if I had of gone with my husband & kids. We cramped as much as humanly possible into 8 days but strangely enough I think there was plenty that we missed. Lucky for me, I am returning to Hong Kong in October 2014 with my family & I will check a couple of other things off my to-do list. 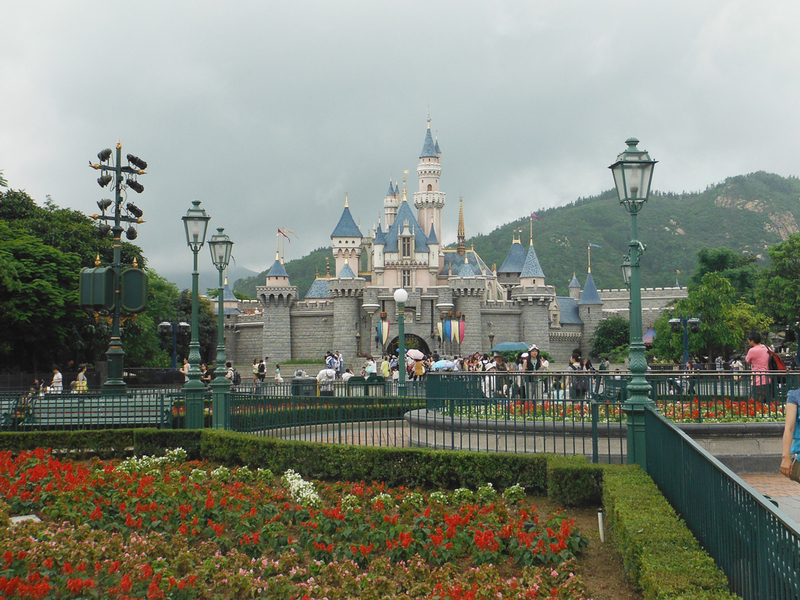 I will be returning to Macau & Disneyland but everything else will be new to me also so that we can explore as a family. Until next time, keep traveling!